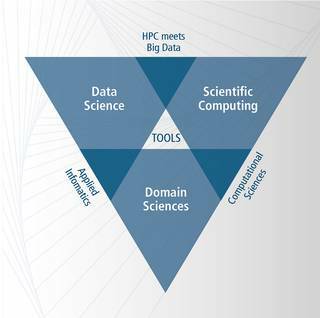 Data structures of immense size and complexity ("big data") play an increasingly important role across a wide range of scientific disciplines. The gain of information from big data requires approaches exceeding the limits of classical statistics and serial computing. Instead, novel tools for the storage, processing, visualization and analysis of data using high-performance computing systems are required. In face of the growing complexity of the underlying models, the development of custom-made algorithms and software solutions is indispensable for the efficient simulation of the problems under consideration. The UoC Center for Data and Simulation Science (CDS), founded in January 2018, addresses these challenges by bringing together scientists from the domain sciences (e.g. natural sciences, life sciences, economics, social sciences, humanities etc.) and researchers with a strong background in data science and scientific computing. The center aims at developing tools with great innovative capacity and shaping novel scientific disciplines, such as high-performance data analytics. The unique strength of the CDS lies in a proven track record of excellent research in various data-intensive scientific domains with great societal impact which is combined with excellent theoretical and technological foundations.